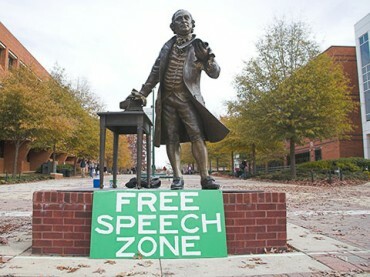 Missouri became the second state to block “free speech zones” on college campuses this week, following Virginia’s move a year ago. Any person may freely engage in noncommercial expressive activity so long as the person’s conduct is not unlawful and does not materially and substantially disrupt the institution’s functioning. It also gives people whose “expressive rights were violated” the right to sue the school and recover damages of $500 to start and $50 each day that the violation continues. The Foundation for Individual Rights in Education said it was instrumental in working with lawmakers to draft and push through the law, and noted that groups from left to right supported the bill. FIRE said it was “available to work with Missouri’s public colleges and universities to eliminate unlawful restrictions on free speech in order to achieve compliance with the new law,” for no charge. In both states, Democratic governors signed the bills into law, raising the question why Republican governors and legislatures – who have “total control” of nearly half the states – have yet to get through legislation that kills free speech zones. Read the Missouri bill and FIRE’s post.